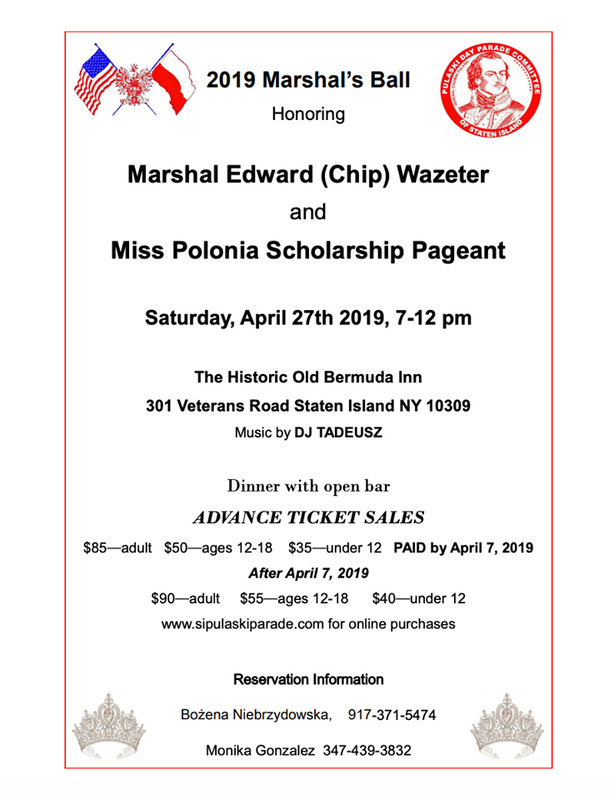 We invite everyone to join us on April 27th 2019 at The Old Bermuda Inn on Staten Island in celebrating this year's Contingent Marshall, as well as witnessing the selection of this year's Miss and Junior Miss Polonias'. This year, the Pulaski Day Parade Committee of Staten Island is proud to honor Edward "Chip" Wazeter as the Staten Island Contingent Marshal for 2019. Chip has been a long time member of the organization and has served on its Board of Directors for the past several years. He has paricipated in the annual Pulaski Day Parade on Fifth Avenue marching first with the New York City Fireman's Pulaski Association and then again with the Staten Island contingent. Chip is a humble individual who has quietly helped the organization behind the scenes for many of their events. Tickets: $90 for adults, $55 ages 12-18, $40 under 12. To purchase tickets, you can either visit our website and pay electronically or you can also call either Bozena Niebrzydowski at (917)-371-5474 or Monika Gonzalez at (347)-439-3832 to make your reservation. We hope to see you all there!